Priests in red vestments lead Red Mass in Fall 2017. 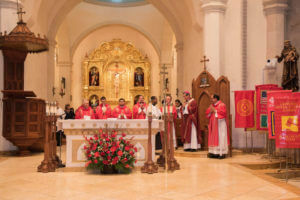 As members of the legal community prepare to reflect on the intersection of faith and law during Red Mass in October, it may be equally important to remember how faith has played a part in 300 years of San Antonio history. Founded in 1731, San Fernando Cathedral is recognized as the first church built in San Antonio, the oldest church building in Texas and one of the oldest cathedrals in the United States. As the oldest church in San Antonio, the cathedral represents not just the history of Catholic tradition in San Antonio, but the service, culture and civic engagement of the community. One particular example of civic engagement is the Red Mass, in which many members of the legal community take part. Red Mass is an annual reminder to those in the legal profession of the relationship between law and divine justice. The legal community of San Antonio will gather for the 66th Annual Red Mass on Thursday, Oct. 11, at 6 p.m. at the San Fernando Cathedral. St. Mary’s alumnus and attorney Martin Beirne will give welcome remarks and Archbishop Gustavo García-Siller will be the presider. This unity of faith and law makes it seem fitting that the Bexar County Courthouse and the Cadena-Reeves Justice Center sit in the shadow of the San Fernando Cathedral. Red Mass is thought to have originated in 1245 in the Cathedral of Paris to invoke the guidance of the Holy Spirit on the judges of the ecclesiastical courts. Red is the liturgical color associated with the Holy Spirit and the term “Red Mass” refers to the red robes worn by the judges and the red vestments worn by the priests. This article was reprinted with permission from Today’s Catholic. 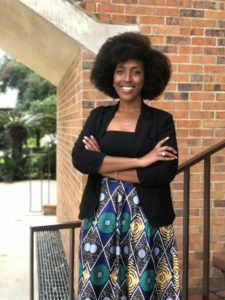 Danica McKinney is a third-year J.D. student attending St. Mary’s University School of Law.